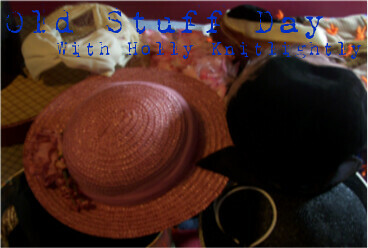 Holly Knitlightly: Old Stuff Day! This is a photo from Brianna Minks of all of her vintage hats from the 40s-60s! It got me thinking and I'm actually going to stretch this day into two days... tomorrow I'm going to go over to my Nana's house & take photos of a bunch of her old things! She has a TON of old things and I think it would be fun to take photos of everything and document it. Maybe you guys want to join in? Take some photos of your old things & share them on your blog tomorrow? Let me know if you're going to participate! I'll link to your blog tomorrow! I also want to wish the lovely Vanessa a happy birthday!!!!!!!! Hope you have (err.. HAD!) an amazing day!! I love old vintage things!! Going though my grandmothers things is so much fun... and I also tend to get to walk away with a vintage beauty from her jewelry collections. I just ordered the Sycamore Scarf from your shop.. I've had my eye on it for a while now.. I'm so excited!! I can't wait for it!! I love old things, I will try and do that this evening!